Folks, 'All Hail The Power of Jesus Name' hymn is one of the most well known hymns in Christianity. It is sung in almost all the major Christian denominations and found in most hymns. Edward Perronet, a Frenchman who settled in England in 1680, is the author of this hymn. His father was vicar of Shoreham parish church from 1728 to 1785 and was known as trusted adviser to the Wesleys. Edward followed John Wesley on his journey and eventually he became Minister of the Countess of Huntingdon's Chapel, Canterbury. 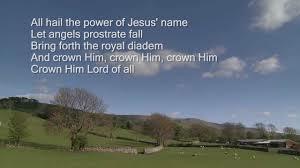 All the Power of Jesus Name is often called the 'Coronation Hymn'. The basic, constant, proclamation is 'Crown Him Lord of All'. It is simply among the finest in English hymnody. It made it first appearance in the November, 1779 issue of the Gospel Magazine. Augustus Montague Toplady, author of "Rock of Ages" was the editor of this magazine at that time. All Hail The Power of Jesus Name lyrics.